A LEADING IRISH keyboardist, who played with the likes of Aslan, the Blades and Van Morrison, has died following a battle with cancer. Belfast-native Patrick ‘Fitzy’ Fitzpatrick played with Aslan for over 20 years, and tributes have been paid to him across social media following the news of his death this morning. In a post on their Facebook page, Aslan said that the group was “saddened to let you all know that our good friend and keyboard player… passed away peacefully this morning”. They said that Fitzpatrick had played with “lots of other great bands but we liked to think of him as ours”. In a separate post, the Blades said the whole band were “utterly crushed” to hear of his passing, calling him one of the “most talented musicians this country has ever produced” and the “Belfast maestro”. I was very sad to hear of the passing of Pat Fitzpatrick today. A master musician and an old friend. Rest In Peace. 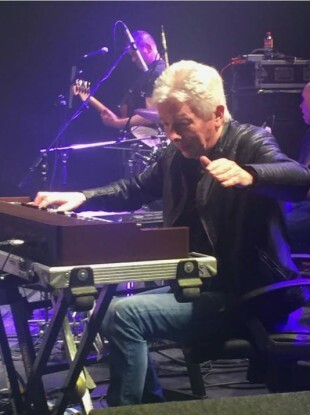 Aslan also said that the keyboardist had been “rocking the roof off the Cork Opera House” with them as little as 11 days ago, and that they had “great memories together”. Email “Aslan pay tribute as keyboardist Patrick 'Fitzy' Fitzpatrick dies following battle with cancer ”. Feedback on “Aslan pay tribute as keyboardist Patrick 'Fitzy' Fitzpatrick dies following battle with cancer ”.